Montesano is the county seat of Grays Harbor County and sits at the confluence of the Wynoochee and Chehalis Rivers. This small city of 4,000 people is part of western Washington, just inland of the Pacific Ocean and Grays Harbor and 11 miles east of Aberdeen, the county's largest city. Montesano claims to be the home of tree farming and historically has been a big part of the state's timber and farming industries. The area is still largely rural and agricultural, though the city continues to slowly grow. 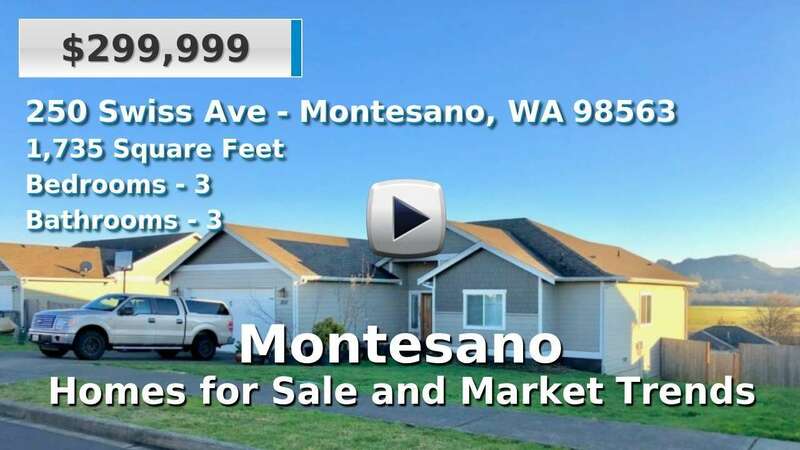 Montesano offers a small mixture of well-established and newer homes for sale, typically on the water, acreage or both. 3 Beds | 1.5 Baths | 2055 sq. Ft.
5 Beds | 3 Baths | 2256 sq. Ft.
3 Beds | 2.5 Baths | 5064 sq. Ft.
4 Beds | 2 Baths | 3510 sq. Ft.
4 Beds | 2.75 Baths | 3204 sq. Ft.
2 Beds | 1.75 Baths | 1352 sq. Ft.
2 Beds | 1.5 Baths | 2410 sq. Ft.